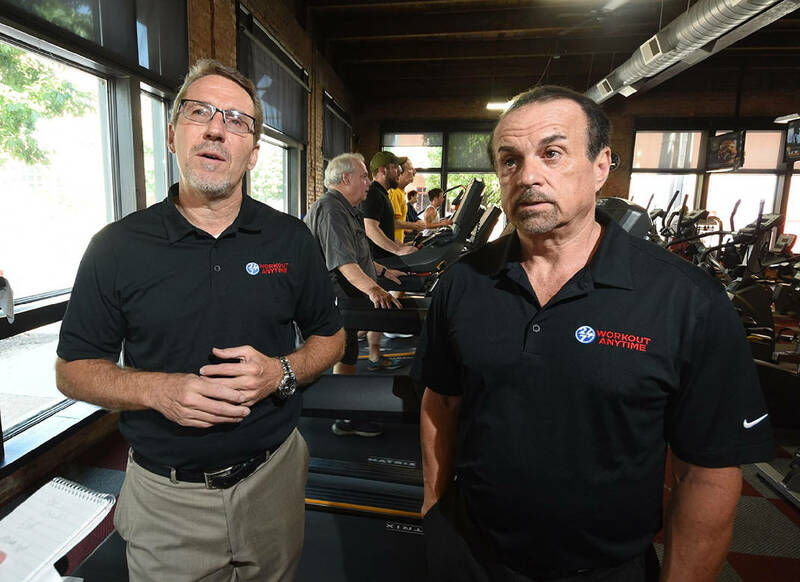 Workout Anytime owner Jeff Londis, left, and regional director Ted Brisebois, talk about the expansion of their business from the Cherokee Boulevard location in North Chattanooga. Jeff Londis co-founded Benchmark Physical Therapy in 1995 and helped build the Chattanooga-based PT therapy chain to more than 350 clinics either owned or managed by Benchmark across the country before selling his interest in that business a couple of years ago. The 57-year-old Chattanooga businessman is flexing his entrepreneurial muscles again in a different industry he bought into a decade ago and has grown to soon include five locations. Londis, the local franchisee for Workout Anytime, hopes to have at least 10 locations and thousands of members in the Southeast within the next three years. Londis, who is a co-founder of the private equity firm White Oak Enterprises, bought the Workout Anytime locations in Hixson and the North Shore after leaving Benchmark. Since buying the franchise, he has opened other Workout Anytime franchise locations in Chatsworth and Calhoun, Georgia. In September, the fifth location will open in Dayton at 200 Able Drive. Chattanooga already has a wide range of health clubs, including chains like Planet Fitness, Gold’s Gymn, Curves, as well as locally owned companies like Sportsbarn. In 2016, the International Health, Racquet & Sportsclub Association (IHRSA), estimated the nation’s 36,000 membership-based exercise facilities had total membership of 57.25 million. Despite the competition from such gyms and other exercise facilities at YMCA centers, schools and churches, the managers of the local Workout Anytime franchise insist they are unique in their hours of operation, membership value and exercise options. Workout Anytime owner Jeff Londis. The local Workout Anytime clubs are staffed most days from 9 a.m. to 9 p.m., and during other hours members may access the gyms with a key card. Security cameras, emergency phones and the design of each gym keeps members secure during overnight hours, Brisebois said. Unlike many such membership gyms, members of Workout Anytime don’t have to sign a long-term contract and are able to choose from a number of membership options. Basic membership for gym access is $19 a month; premium membership that provides access to hydro massage and tanning booths cost $29 a month, and a friends and family membership plan is available for $39 a month. Business plans for multiple employees also are available and most of the gyms offer personal trainers for additional fees. The typical gym is about 8,000 square feet, which Londis says “is the perfect-sized model for mid-sized markets,” which led him to expand to Chatsworth, Calhoun and Dayton since buying into the business. The typical gym costs about $300,000 in capital costs for exercise and other equipment, which includes a variety of Matrix Fitness equipment with multiple television screens along with HydroMassage facilities, yoga mats and locker rooms. Each unit needs 2,000 or more members to make it work financially, Londis said, and that can often take a couple of years to achieve.